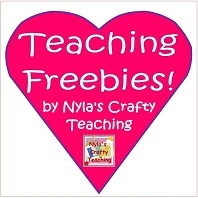 Nyla's Crafty Teaching: What Every Crafty Teacher Needs! If you love to teach and you love to make your own teaching resources or refine existing ones, then you are a crafty teacher! We have the best jobs ever because it is therapeutic to be creative, the students definitely appreciate your efforts especially if they were a part of the creative process and best of all, it makes teaching and learning fun! Storage Space - If you don't have much horizontal space, then use lots of shelving and stack-able drawers to create all of the vertical spaces you need. I also use over-the-door hangers to hang some of my pocket charts. 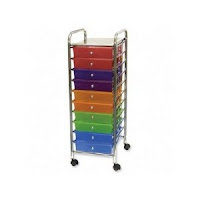 The stacking mini drawers below are labeled with my polka dot classroom labels. A Laminating Machine - It does not have to be large or heavy-duty. Mine is light and portable. I use it at school and take it home for the Summer break. 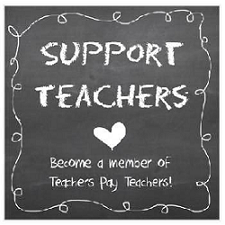 I laminate classroom posters, certificates, my card games, fold-able cut-outs, signs, pictures, bulletin board labels, and write on-wipe off activities. And of course, all laminators use pouches. I tend to use the 9" x 11.4" pouches for the letter-sized sheets of paper. Mechanical Pencil Sharpeners - For both art time and regular paper and pencil tasks. It seems like I have some chronic pencil point breakers on my hands... or is it that they want them to break so that they can get to sharpen them? I can't tell. This is the X-Acto school heavy duty sharpener which was designed by teachers. That's right, teachers. They last very long if you follow the #1 rule: no crayons and no plastic coated pencils. So once your students stick to the regular pencils for this, they will have sharpened pencils which leads to neater writing and less time fiddling with manual sharpeners. Sticky Stuff - I use glue, double sided tape, mounting tape and a glue gun. For light sticking or heavy bonding, do not limit yourself to only one type of adhesive method. There are also the non-sticky methods of bonding - using staplers, florists' wire, Velcro, and fasteners. 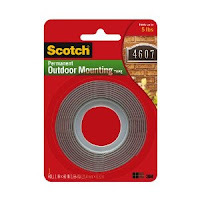 This is the strongest mounting tape you'll ever find... it's exterior mounting tape by Scotch but I use it for hanging up my bulletin boards. The really hold up well, I cannot complain! Once, you have all of the materials you need, then the easy part is over, the hard part is finding the time to create all of the things that are on your do-do list! Good luck! Hi! It's always nice to meet another Trini blogger! I like having art as the fourth R (I never heard it like that before, love it). I get everything from Amazon because I'm in Tobago so my choice of products here is a bit limited :( If you click on the picture of my laminator and the electric sharpener it'll take straight to where I got them on Amazon. The sharpeners on the lanyards in this post http://ow.ly/t3miA, I got at the Ten Dollar Store in Scarborough. Ok Thanks for the response..